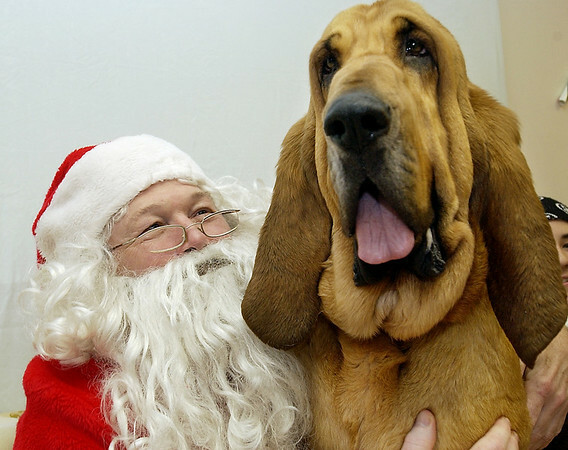 Sawyer, a 142-pound bloodhound, does his best impression of a lap dog as he sits with Santa Sunday at the Cherryland Humane Society's annual Santa Paws open house. For a $10 donation, owners could have their pet's picture taken with Santa. Donations benefited the society's programs for shelter animals. Prizes were awarded to the cutest, smallest, largest, best costume, and most unusual pet. The open house included tours of the animal shelter facility at 1750 Ashlberg Road.